Grulla Elementary was selected by the U.S. Border Patrol Department to name a new horse they had just acquired for their Horse Patrol Unit. The school was honored with the task of naming one of their six (6) horses that will be utilized in patrolling the border. The school held a contest in which every child was given a picture of a horse and their task was to color the horse and give it a name. Once all students submitted their artwork and the name they had chosen a total of 35 were selected. These were then sent to the Border Patrol Office for the final selection of the name that would be given to the patrol horse. 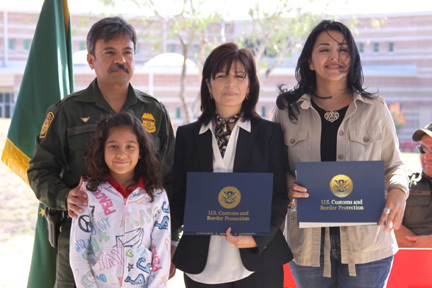 On Thursday, October 20, 2011 a ceremony was held at the Grulla Elementary to annonunce the winner of the contest and to christen the horse with its very own name. The winner of the contest was Alica Villarreal a 4th grade student in Ms. Olga Barreiro's class who chose the name "Bandit" for the horse. A proclamation was read by Mr. Felix Cantu-Border Patrol Director who congratulated Alica for naming the horse. Mrs. Monique Villarreal, Principal, said that choosing Grulla Elementary for this project has generated great enthusiasm in her students and in the entire community. She congratulated all of the students for participating in this project. Alicia was presented with a certificate and a goody bag for her participation. Ms. Molly Trevino (Alicia's mother) was very exited and proud of her daughter's accomplishment.